Oxford Instruments offer a range of coating thickness analysers, gauges and SEM based systems for measuring a broad range of coating thickness on almost any metal substrate, whether ferrous or non-ferrous. X-ray Fluorescence (XRF) instruments work by exposing a sample to be measured to a beam of primary X-rays. The atoms of the sample absorb energy from the X-rays, become temporarily excited and then emit secondary X-rays. Each chemical element emits X-rays at a unique energy. By measuring the intensity and characteristic energy of the emitted X-rays, an XRF analyser can provide qualitative and quantitative analysis regarding the thickness and composition of the material being tested. 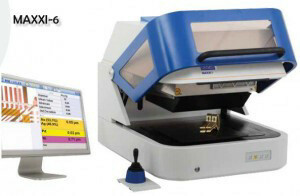 The Oxford Instruments Maxxi-6 is the latest XRF based coating thickness analyser from Roentgenanalytik (now an Oxford Instruments company). The Maxxi-6 is capable of analysing a wide range of elements: from P15* to U92 in the periodic table – allowing the measurement of almost every type of metallic coating. Its modular upgrade path offers potential for changes in requirements protecting your investment and minimising long-term ownership costs. 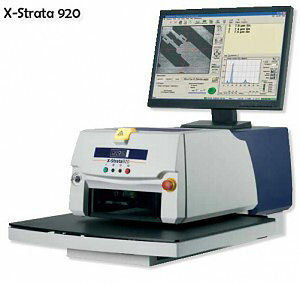 The Oxford Instruments X-Strata is a cost-effective, rapid and reliable XRF for coating thickness measurement and materials analysis. It offers a wide range of element determination, from Ti22 to U92. LayerProbe uses robust quantitative analysis routines available in AZtec and integrates them with powerful thin film analysis engine for reliable results. The software also includes a tool to predict solubility and to advise on optimum analysis conditions as well as a simulation tool to accurately simulate X-Ray spectra from layered specimens. For more information on AZtec and other microanalysis solutions for SEM, TEM and FIBSEM click here. A wide number of portable gauges for coating thickness measurement are available from Oxford Instruments X-ray Technology with either integrated or tethered probes. Contact us to see which gauge is right for your application.